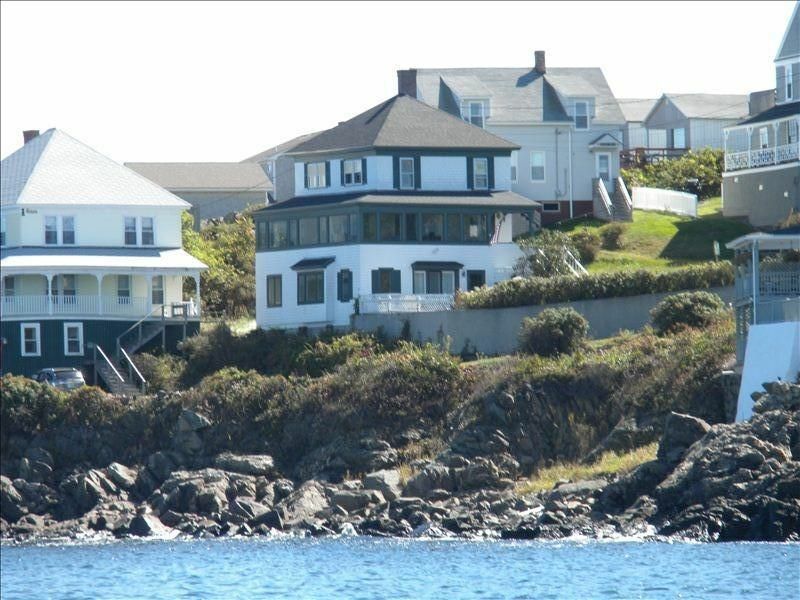 This well kept home offers fabulous views of the Atlantic Ocean and the rocky coast of Maine. Watch the sunset or the sunrise while listening to the crashing surf. It is surrounded by other turn of the century cottages and is located a short walk from restaurants, shops, Short Sands and Long Sands beaches, the Nubble Light House and entertainment for all ages. The quaint villages of York, Kittery and Ogunquit offer more beautiful scenery, historic sights, antiques, a summer theatre, dining and shopping. Kennebunkport and Portmsouth, NH are also nearby. The house, built in 1901, has been totally updated and provides a great location. The custom kitchen is equipped with all you need to cook lobster or roast a turkey. It has a farmers sink,Thermador and Viking appliances and granite counter tops. There are 5 bedrooms , 3.5 bathrooms, an outdoor shower, outdoor living space, a wood burning fireplace and Wi Fi . Pets are NOT allowed under any circumstances and there is No Smoking allowed. In the effort to maintain the condition of this home there is a MAX. occupancy of 8 at ALL times, this is a small cottage not available to groups over 8. My husband and I bought the house with the intention of enjoying Maine more in our retirement years and to share with friends and family along the way. We love the ocean views, the cottage feel, the scenic walks along the shore, being surrounded with other quaint, turn of the century homes and the local food ,entertainment scenic sites and beaches that we can walk to. Three full bathrooms and half bath off the kitchen. For rent in York Beach at The Daily Grind Coffee shop. Beautiful, well equipped kitchen with granite counters and Viking appliances, heat year around, patio, grill, and an outdoor shower. No weddings or receptions allowed, Number of occupants, of all ages, not to exceed 8 at any time. The house was amazing!! Well stocked kitchen and supplies linens made the stay easy and enjoyable! The place was exactly as shown as n the pictures! Spectacular views and wonderful location!! Great place to explore all that Maine has to offer! My family of 7 (including my two year-old) stayed here the first week of July. Let me just start by saying that this place is absolutely perfect! In an area filled with churn-and-burn rental properties that feel very commercial, this home stands out as just that - a home! From the moment we walked in, we enjoyed absolutely every second. The house was spotless (seriously - I'm a neat freak) and the attention to detail (the knob protector on the cabinet by the fridge, for example) was evident in every room. My wife and I, along with our little girl loved having the basement to ourselves as it was two bedrooms and our own full bath (with tub!). The main level is wonderful and we spent as much time as possible in the living room/kitchen area which has BREATHTAKING views of the ocean! Seriously --- I find myself day dreaming about those rocking chairs...The upstairs was complete with three bedrooms was more than enough space! I could go on and on but I'll keep this short - if you're looking for an amazing Maine stay, look no further. It's a ten minute walk to the beach/town and ten minutes to Nubble and the worlds best ice cream...Colleen was fantastic, even calling us the first morning to make sure we got in ok. It's evident that she cares and we sure appreciate it! This house has beautiful views from lots of windows overlooking the coastline. The kitchen is amazing, bedrooms are comfortable and outside patio is a great place to grill and hang out. Added bonus is the Nubble lighthouse is an easy walk away. Our family would definitely stay here again. Our family is scattered and we decided to rent for a long weekend in April, 2015. Family from OR and NC got a taste of winter as we had storms our first 2 days, but the house could not be more comfortable. Our puzzle loving Mom was pleased and had no problems w/layout despite advanced age. Great place for eating in, a must as only a few places are open year round within walking distance - though we highly recommend the Union Hotel any time of year. We walked both beaches, and Long Sands is not far if you go by the main road in. For Mom this was key. The longer route (by Nubble) is for folks who watch for the occasional car off season, heavier traffic on. This is why Ocean Ave Extension works for us - less traveled and right on the ocean. The younger folks stay on ground level so late night noise is contained (by young, many of us are 50+). We enjoyed our stay so much that we rented for Christmas week and had a delightful (unseasonably warm) 2nd visit! Owner is wonderful and let us leave a little later so we could relax during laundry/loading/tidying up. Immaculately clean on arrival. Note: if you have reasonably sized vehicles, the driveway worked for 4 cars with thought to whose car needs to leave. We love this place and hope to return. Our first family vacation with both kids, their spouses, and our grandkids. The house was roomy (for 8 of us) and perfectly outfitted from sheets and towels, to pots and pans, and beach chairs. The view is unparalleled and it would have been easy to sit in the rocker and look at the ocean for 2 weeks. It is a quick walk to Short Sands Beach, a small family beach, and the beach shops and restaurants. It is also close to the Nubble Lighthouse. May I recommend taking a thermos of coffee and enjoying sunrise at the lighthouse? I guess the best way I can end this is that my full family is coming back next year. Antiques, historic places, local art, outlet shopping, quaint shops, fine food, taffy, fudge, ice cream, arcade, zoo, walk the cliff paths, the Nubble Lighthouse and hiking or biking Mt. Agamenticus. Call for last minute rates The rate is based on the number of occupants. Do not wire transfer money without contacting me by phone first.